These materials offer superior strength and fit, combined with excellent esthetics. Over the past decade, the companies providing metal-free ceramics have continually updated their products. The latest generation of materials provides improved opalescence, combined with lifelike shades and translucencies. All-ceramic restorations are healthier for gum tissues and provide long-lasting and reliable results. The lack of metal results in zero darkness around the gum margins and light is transmitted through these materials in a way that closely replicates a natural tooth. What is Zirconia and what are its benefits? Zirconia is sometimes described as being like a white metal and its flexural strength makes it easily as strong as traditional PFMs. Solid Zirconia restorations are often ideal for people with bruxism. They are fabricated using CAD/CAM technology, resulting in an excellent marginal fit, reducing chair-time and the risk of remakes. Originally, zirconia was only available in its natural white color, but nowadays it is manufactured in a huge variety of shades and translucencies, making it simple to match the restoration to the adjacent teeth. Porcelains can be layered over the zirconia, giving our ceramists the ability to accurately replicate the characteristics found in natural teeth. 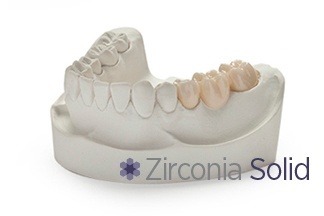 Zirconia is ideal for anterior and posterior crowns, as well as for bridges. There are two different types of zirconia. 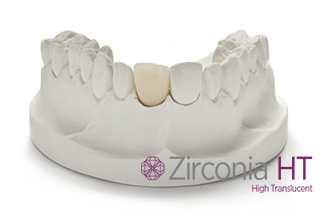 Higher translucency zirconia is best used on anterior bridges of up to three units. The natural translucency and opalescence make this material perfect for anterior and posterior crowns, but it is not ideal for bleach shades, inlays and onlays and for veneers. Monolithic or layered zirconia is stronger and can be safely used on large span bridges, as well as for inlays and onlays while still providing excellent esthetics. This material is ideal for masking heavily discolored preps and is suitable for restoring dental implants. The higher opacity of this material makes it unsuitable for veneers and it is not ideal for anterior crowns. What is e.max and what are its benefits? This is a pressed or milled lithium disilicate material. It is not quite a strong as zirconia but is three times stronger than Empress, Ivoclar’s original pressable ceramic. It is available in a huge range of translucencies and shades. Technicians can produce full contour restorations, or these can be cut back and layered with porcelain to enhance the esthetic effects. 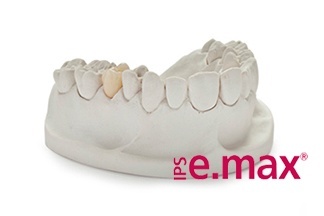 You will find e.max is suitable for singles crowns anywhere in the mouth. This material is very good for inlays and onlays, and is best for veneers. Choosing e.max can provide particularly good results where patients perhaps need a combination of these different restorations, especially when they are adjacent to each other in the mouth. Being able to use the same porcelains to layer the restorations will guarantee they all blend in beautifully with each other. It is possible to construct three unit bridges using e.max, but its use it not advisable for patients with bruxism or posterior bridges. If you have a particular case you wish to discuss with our experienced technical staff, then we are always more than happy to talk to you about the different materials available and which might be most appropriate. When correctly used, these materials can create stunning results, leading to very happy patients.